These needles are constructed of light bodied carbon fiber, so they have high tensile strength, making them very difficult to break. Comes in US Sizes 0, 1, 1.5, 2, 2.5, 3. Includes clear vinyl case. 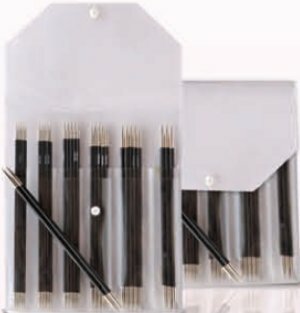 Knitter's Pride Zing Double Pointed Needles is a similar needle: 6" / 6.5" and double point. You may also like ChiaoGoo TWIST Red Cables Needles, which is another similar needle: 6" / 6.5" and multiple sizes or sets US size. Addi FlipStix Needles From $16.96 to $19.95Select options on sale now!